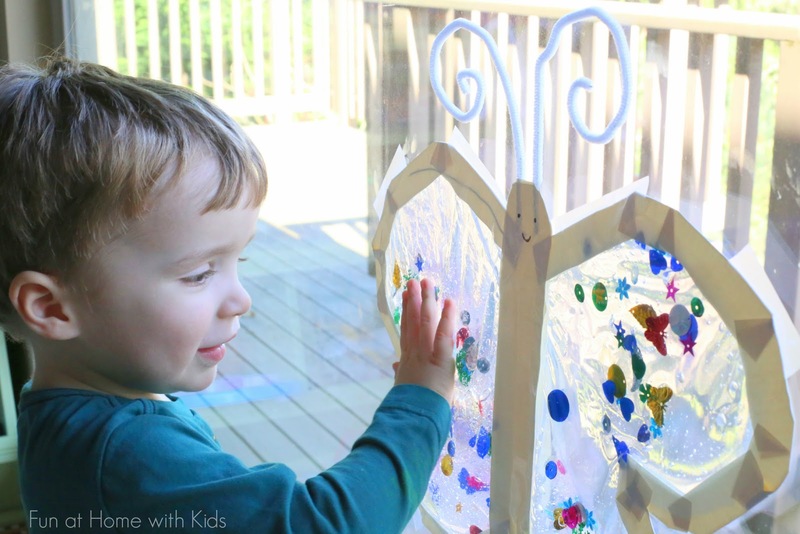 This idea is inspired by the brilliant Teach Preschool. 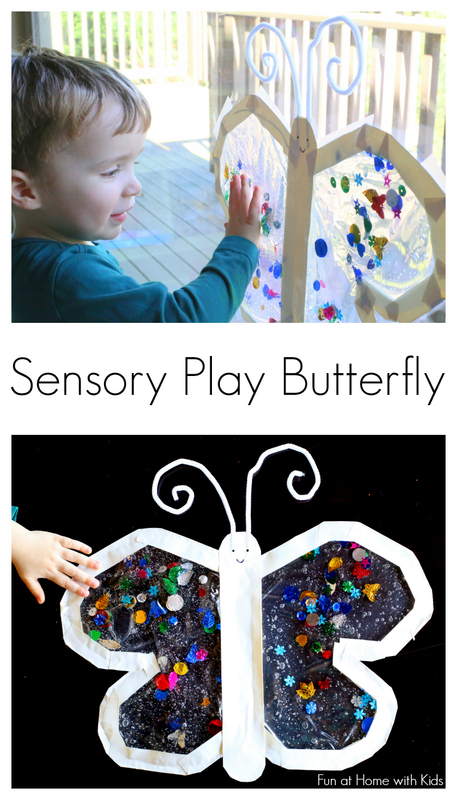 I loved her idea for Sensory Butterflies (hers are different so please do check them out!) and decided to make a different version for little X. First we played with him on the table. Then I hung him up in the window. 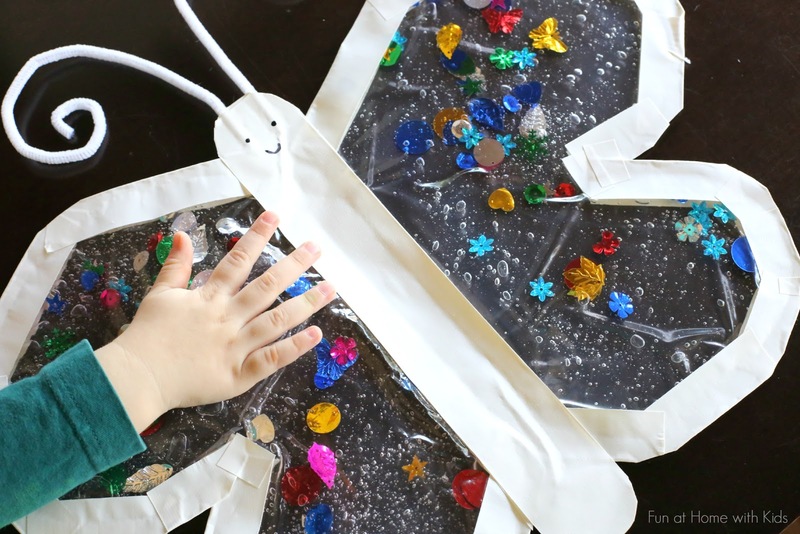 X had so much fun squishing his wings and moving the little sequins around. 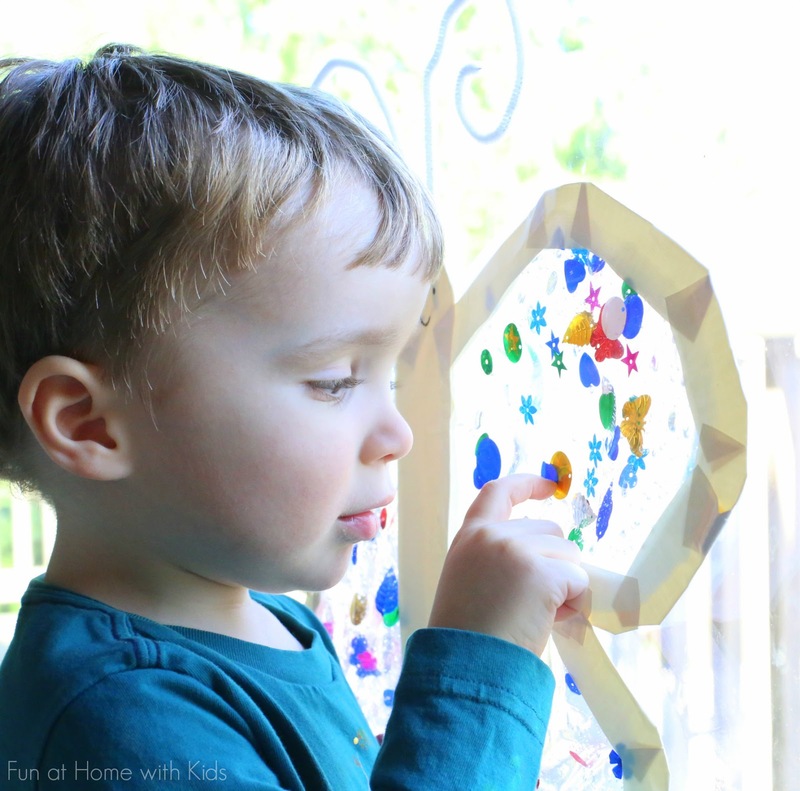 No mess AND it only takes about 10 minutes to make one! 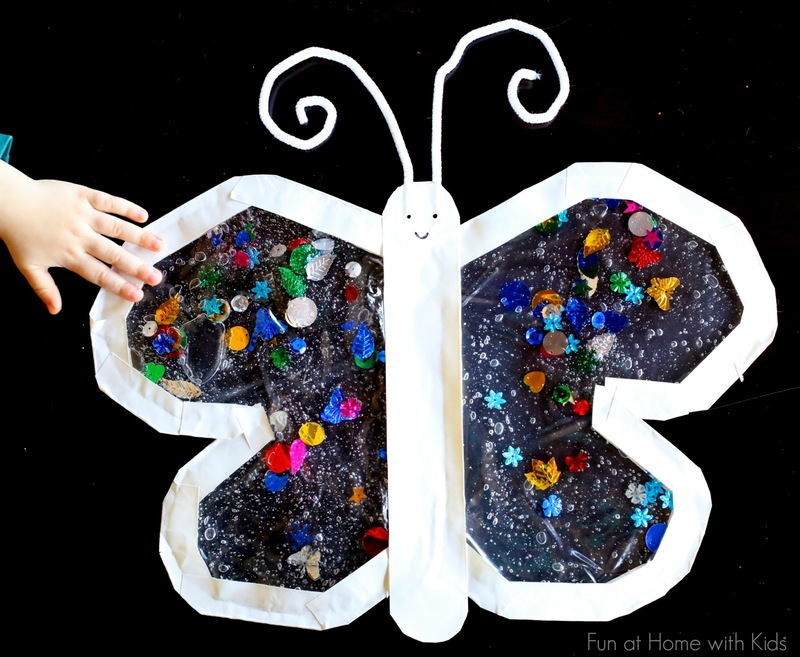 Lay two Freezer Ziploc bags on top of one another and draw the outline of a large butterfly wing. Cut out the wings along the line. Cut various sized pieces of colored duct tape and fold them over the edges of the wings to create a border. Leave a small opening on each wing. Fill it with a handful of sequins and then add about a cup of hair gel (we get ours from the Dollar Tree). Once the gel and sequins are in, wipe down the remaining opening on the wing and seal it with duct tape. Place the wings an inch or so apart on a table and add a strip of tape (this will become the body). Flip the butterfly over, place two pipecleaners on the tape (antennae) and seal them in by adding another strip of tape in the same place on the opposite side. Use scissors to round off the top and bottom of the tape forming the butterfly's body. Add two eyes and a mouth with a permanent marker. 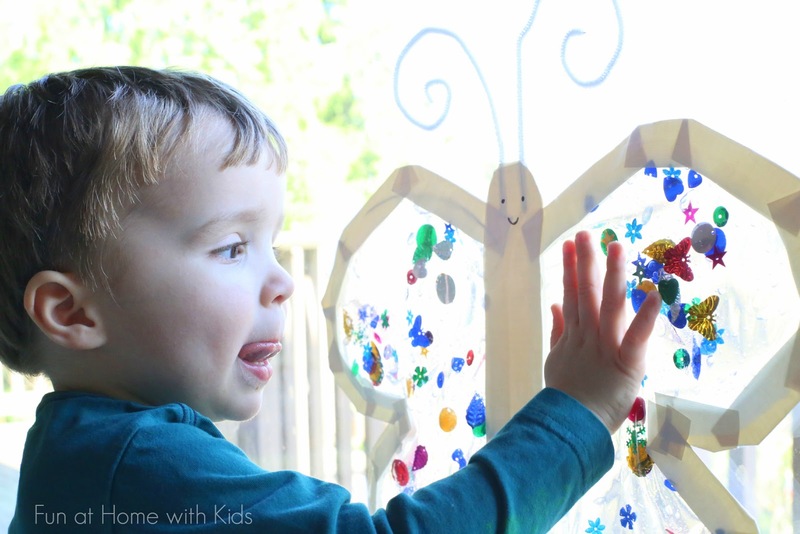 And now you've got a Mess-Free Sensory Play Butterfly for your little one! Please note that this toy does include chokable parts (inside the bags) and as such play always needs to be supervised. It is possible to poke through the bag, so please always inspect it for holes or tears before giving it to your little one for play.